One-pot meals are a great way to reduce time and effort, particularly with cleanup. In this recipe, veggies and shrimp cook together with the pasta. The mixture is then drained, returned to the pot, and tossed with feta, lemon and parsley. So easy and yummy! This recipe also works great with leftover grilled chicken in place of the shrimp. Simply toss in the grilled chicken with the garlic and sauté together for a minute until warmed. Then complete the recipe as outlined below. In a large stockpot of boiling salted water, cook penne 5 minutes less than al dente. Add asparagus; cook 3 minutes. 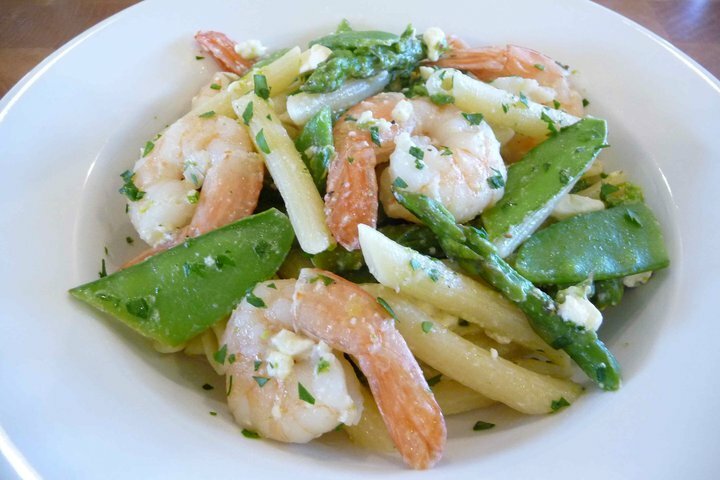 Add shrimp and snow peas; cook 2 minutes. Return empty stockpot to medium-high heat and add olive oil and garlic. Cook garlic until it's fragrant and begins to soften (about 1 minute). Add the drained pasta mixture, lemon juice and half of the reserved pasta water. Season with salt and pepper; toss to combine. Gently mix in feta and parsley; adjust to desired consistency with additional pasta water as needed.